Upcoming Events – Kunckletown PA -The Divine Will and Regional Catholic Traditional Events !!! Tomorrow Friday May 1st – Aside from Catholic First Friday Devotions – Novena Prayers and Relic Veneration at Holy Innocents – there will be a First Class Mass for the Feast of Saint Joseph the Worker – with Gregorian Chant Choir,- procession and full complement of Altar Servers. Traditional Catholic Evangelization to be led by Our Lady into what was termed on the Feast of the Assumption 1991 as the coming required participation of the New Era ! MOST Holy Trinity, Father, Son, and Holy Spirit, I adore Thee profoundly. I offer Thee the Most Precious Body, Blood, Soul, and Divinity of Jesus Christ, present in all the tabernacles of the world, in reparation for the outrages, sacrileges, and indifference by which He is offended. And through the infinite merit of His Most Sacred Heart, and the Immaculate Heart of Mary, I beg of Thee the conversion of poor sinners. He made a partnership and shook hands with the world’s leading $ financial and political backers on Abortion ! Over half of all the Dutch doctors that are certified to administer care to the mentally ill or those with Dementia would encourage or approve SUICIDE ! IF YOU HAVE NOT FIGURED IT OUT YET – WHAT’S GOING ON IN THE WORLD?! IT’S THE RESIDENT CORE THEOLOOGY BEHIND THE NEW RITE OF THE NEW MASS IN THE WESTERN CATHOLIC CHURCH !!! The Armenian Genocide Movie Should Be Watched By Every Christian Adult and Child INCLUDING small children ! There is also the superstition of the Ishmaelites which to this day prevails and keeps people in error, being a forerunner of the Antichrist. They are descended from Ishmael, [who] was born to Abraham of Agar, and for this reason they are called both Agarenes and Ishmaelites. They are also called Saracens, which is derived from Sarras kenoi, or destitute of Sara, because of what Agar said to the angel: ‘Sara hath sent me away destitute.’  These used to be idolaters and worshiped the morning star and Aphrodite, whom in their own language they called Khabár, which means great. And so down to the time of Heraclius they were very great idolaters. From that time to the present a false prophet named Mohammed has appeared in their midst. This man, after having chanced upon the Old and New Testaments and likewise, it seems, having conversed with an Arian monk,  devised his own heresy. Then, having insinuated himself into the good graces of the people by a show of seeming piety, he gave out that a certain book had been sent down to him from heaven. He had set down some ridiculous compositions in this book of his and he gave it to them as an object of veneration. They furthermore accuse us of being idolaters, because we venerate the cross, which they abominate. And we answer them: ‘How is it, then, that you rub yourselves against a stone in your Ka’ba  and kiss and embrace it?’ Then some of them say that Abraham had relations with Agar upon it, but others say that he tied the camel to it, when he was going to sacrifice Isaac. And we answer them: ‘Since Scripture says that the mountain was wooded and had trees from which Abraham cut wood for the holocaust and laid it upon Isaac,  and then he left the asses behind with the two young men, why talk nonsense? For in that place neither is it thick with trees nor is there passage for asses.’ And they are embarrassed, but they still assert that the stone is Abraham’s. Then we say: ‘Let it be Abraham’s, as you so foolishly say. Then, just because Abraham had relations with a woman on it or tied a camel to it, you are not ashamed to kiss it, yet you blame us for venerating the cross of Christ by which the power of the demons and the deceit of the Devil was destroyed.’ This stone that they talk about is a head of that Aphrodite whom they used to worship and whom they called Khabár. Even to the present day, traces of the carving are visible on it to careful observers. As has been related, this Mohammed wrote many ridiculous books, to each one of which he set a title. For example, there is the book On Woman,  in which he plainly makes legal provision for taking four wives and, if it be possible, a thousand concubines—as many as one can maintain, besides the four wives. He also made it legal to put away whichever wife one might wish, and, should one so wish, to take to oneself another in the same way. Mohammed had a friend named Zeid. This man had a beautiful wife with whom Mohammed fell in love. Once, when they were sitting together, Mohammed said: ‘Oh, by the way, God has commanded me to take your wife.’ The other answered: ‘You are an apostle. Do as God has told you and take my wife.’ Rather—to tell the story over from the beginning—he said to him: ‘God has given me the command that you put away your wife.’ And he put her away. Then several days later: ‘Now,’ he said, ‘God has commanded me to take her.’ Then, after he had taken her and committed adultery with her, he made this law: ‘Let him who will put away his wife. And if, after having put her away, he should return to her, let another marry her. For it is not lawful to take her unless she have been married by another. Furthermore, if a brother puts away his wife, let his brother marry her, should he so wish.’  In the same book he gives such precepts as this: ‘Work the land which God hath given thee and beautify it. And do this, and do it in such a manner” —not to repeat all the obscene things that he did. And again, in the book of The Heifer,  he says some other stupid and ridiculous things, which, because of their great number, I think must be passed over. He made it a law that they be circumcised and the women, too, and he ordered them not to keep the Sabbath and not to be baptized. And, while he ordered them to eat some of the things forbidden by the Law, he ordered them to abstain from others. He furthermore absolutely forbade the drinking of wine. The question is in regards to the fact that we already know that there is a civil war within the Catholic Church underway but is there an even more intense one underway “within the Jesuits” and having to do with their new theology on islam and the new widespread theologically shifting sand of protestantism on homosexuality. Is this a component of the new Catholic universalism touted by such high profile Catholic media figures such as Father Robert Barron with “ ALL PEOPLE have a reasonable hope that everyone will go to heaven” and the rest are dogmatic concept ideas” ? Let me refresh my ecclesial historical memory again – The Jesuits were suppressed on and off for over 150 years in the history of the Catholic Church but officially and close to abolishment for 25 years in the 1700s at the time of ______”the French Revolution’s………………..
At the Vatican the radically liberal heterodox “Sisters” that are the Leaders of the major women’s religious orders in the United States met with the Holy Father in business suits yesterday and won a temporary peace treaty despite the destruction they’ve wrought upon the Church and the young Catholics in the US for decades. Sure there a half dozen rock solid orthodox Bishops but the question remains WHERE ARE THE OTHER 400+ ?! Sure there are exceptions of course – Look at the Bishop in Iowa that prevented a self advertised homosexual from becoming a new teacher in his Catholic HS -seen here. To compound matters worse the majority of Faithful Catholic men in this country that are being called to step up and lead their Parishes – their Families and others to Catholic restoration and reform believe that it is somehow a Catholic attribute to remain silent on the situation with the Bishops and the Church. [. . .] For a correct interpretation of Vatican Council II, it is necessary to keep in mind the intention manifested in the conciliar documents themselves and in the specific words of the Popes who convened and presided over it, John XXIII and Paul VI. God, it depends on the primacy of God. The characteristic of the rupture in the interpretation of the conciliar texts is manifested in a more stereotypical and widespread way in the thesis of an anthropocentric, secularist, or naturalistic shift of Vatican Council II with respect to the previous ecclesial tradition. One of the best-known manifestations of such a mistaken interpretation has been, for example, so-called liberation theology and the subsequent devastating pastoral practice. One interpretation of rupture of lighter doctrinal weight has been manifested in the pastoral- liturgical field. One might mention in this regard the decline of the sacred and sublime character of the liturgy, and the introduction of more anthropocentric elements of expression. This phenomenon can be seen in three liturgical practices that are fairly well known and widespread in almost all the parishes of the Catholic sphere: the almost complete disappearance of the use of the Latin language, the reception of the Eucharistic body of Christ directly in the hand while standing, and the celebration of the Eucharistic sacrifice in the modality of a closed circle in which priest and people are constantly looking at each other. This way of praying – without everyone facing the same direction, which is a more natural corporal and symbolic expression with respect to the truth of everyone being oriented toward God in public worship – contradicts the practice that Jesus himself and his apostles observed in public prayer, both in the temple and in the synagogue. It also contradicts the unanimous testimony of the Fathers and of all the subsequent tradition of the Eastern and Western Church. 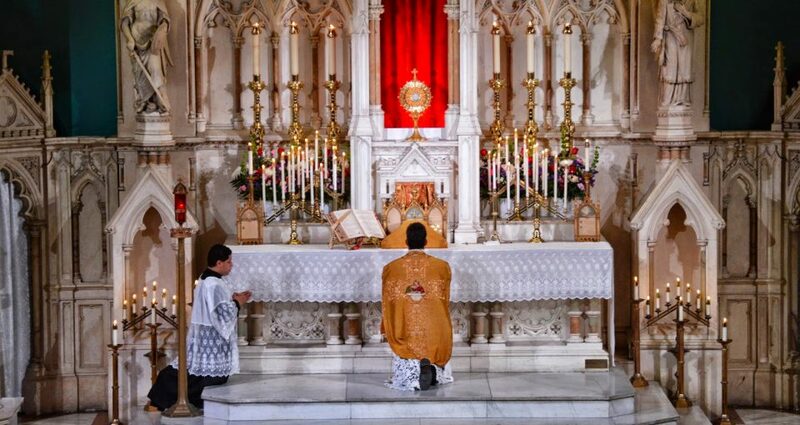 These three pastoral and liturgical practices glaringly at odds with the law of prayer maintained by generations of the Catholic faithful for at least one millennium find no support in the conciliar texts, and even contradict both a specific text of the Council (on the Latin language: cf. “Sacrosanctum Concilium,” 36 and 54) and the “mens,” the true intention of the conciliar Fathers, as can be seen in the proceedings of the Council. In the hermeneutical uproar of the contrasting interpretations, and in the confusion of pastoral and liturgical applications, what appears as the only authentic interpreter of the conciliar texts is the Council itself, together with the pope. In recent decades there existed, and still exist today, groupings within the Church that are perpetrating an enormous abuse of the pastoral character of the Council and its texts, written according to this pastoral intention, since the Council did not want to present its own definitive or unalterable teachings. From the same pastoral nature of the texts of the Council, it can be seen that its texts are in principle open to supplementation and to further doctrinal clarifications. Keeping in mind the now decades-long experience of interpretations that are doctrinally and pastorally mistaken and contrary to the bimillennial continuity of the doctrine and prayer of the faith, there thus arises the necessity and urgency of a specific and authoritative intervention of the pontifical magisterium for an authentic interpretation of the conciliar texts, with supplementation and doctrinal clarifications; a sort of “Syllabus” of the errors in the interpretation of Vatican Council II. There is the need for a new Syllabus, this time directed not so much against the errors coming from outside of the Church, but against the errors circulated within the Church by supporters of the thesis of discontinuity and rupture, with its doctrinal, liturgical, and pastoral application. Such a Syllabus should consist of two parts: the part that points out the errors, and the positive part with proposals for clarification, completion, and doctrinal clarification. In essence, there have been two impediments preventing the true intention of the Council and its magisterium from bearing abundant and lasting fruit. One was found outside of the Church, in the violent process of cultural and social revolution during the 1960’s, which like every powerful social phenomenon penetrated inside the Church, infecting with its spirit of rupture vast segments of persons and institutions. The other impediment was manifested in the lack of wise and at the same time intrepid pastors of the Church who might be quick to defend the purity and integrity of the faith and of liturgical and pastoral life, not allowing themselves to be influenced by flattery or fear. So there is truly a need for a Syllabus on the Council with doctrinal value, and moreover there is a need for an increase in the number of holy, courageous pastors deeply rooted in the tradition of the Church, free from any sort of mentality of rupture, both in the doctrinal field and in the liturgical field. These two elements constitute the indispensable condition so that doctrinal, liturgical, and pastoral confusion may diminish significantly, and so that the pastoral work of Vatican Council II may bear much lasting fruit in the spirit of the tradition, which connects us to the spirit that has reigned in every time, everywhere and in all true children of the Catholic Church, which is the only and the true Church of God on earth.